Though Sri Arumuga Navalar’s 181st birth anniversary falls on 18th December 2003 the Trincomalee District Young Men’s Hindu Association organized his Guru Pooja on Sunday. 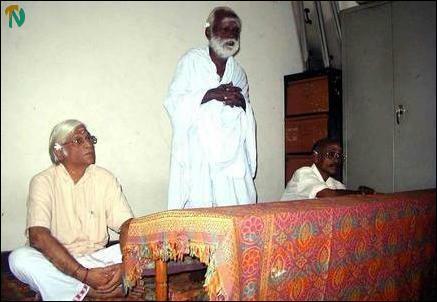 The TDYMHA organized the event with the octogenarian Saivite activist Mr.P.Kandiah (Gandhi master). Attorney-at Law Mr. K. Sivapalan and Assistant Director of Education Mr. S.Vipunasekaram spoke of the services Navalar rendered to Saivism and Tamil language. Many Tamils in South India and Sri Lanka are Saivaites, a religion they consider peculiar to the Tamil land. Sri Arumugam Navalar was born on 18th December 1822 in Nallur in Jaffna peninsula at a time when several elite and middle class Tamils in Jaffna felt that Ceylon’s British rulers were promoting Christianity and the English language at the expense of Saivisim and Tamil. Navalar’s original name was Arumugam. For his services rendered to Saivaism and Tamil language and culture, head of the great Tamil mutt in South India, Tharmapuram Atheenam, conferred on him the title “Navalar” in recognition of his literary and debating skills. Since then he was known as Arumuga Navalar. At the age of twelve he completed his Tamil education under the traditional, non-formal education “Guru-Shisya” mode of learning. He later joined Jaffna Methodist English School, currently known as Jaffna Central College for his English education when Rev Peter Percival was its Principal. Navalar assisted Rev. Percival in translating the Bible from English into Tamil. Gandhi master presides over Arumuga Navalar guru pooja Sunday held at the TDYMHA office. ( L) Atrroney-at-Law Mr.Sivapalan and Mr.Vipunasekaram ( extreme right) are seen seated. Navalar emerged the champion of the Saiva renaissance movement of the nineteenth century, both in Jaffna and South India. He published several ancient Sangam literary works, which were found in Palmyra (Ola) leaf manuscripts. He also wrote learned commentaries to ancient and medieval Tamil grammars Navalar was versatile writer, eloquent speaker and efficient debater. Navalar wrote several books on Saivaism such as ‘ Saiva Vina Vidai” and ‘ Pala Padam. Navalar developed a prose style even laymen could understand. 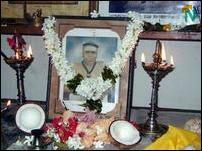 Arumugam Navalar established schools in several parts of Jaffna peninsula to propagate Saivaism. His critics however charge that he upheld the oppressive caste system in Jaffna and that the version of Saivism he propagated in Jaffna had the tendency to entrench traditional social inequalities in the peninsula.